There are still tomato plants with tomatoes all over them. But most have been pulled, the wire support frames have been stacked. 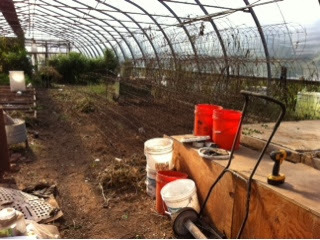 The frames will go into the top of the hoop house, where they hang above our heads until next tomato season. The ground has been cleared of weeds and raked out. 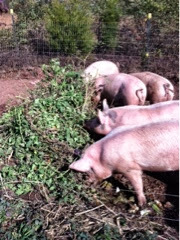 And the pigs ate until they could no longer eat. Next, we use the Speedy Seeder and get the rest of the spinach seeds in. Then insulation in the house.